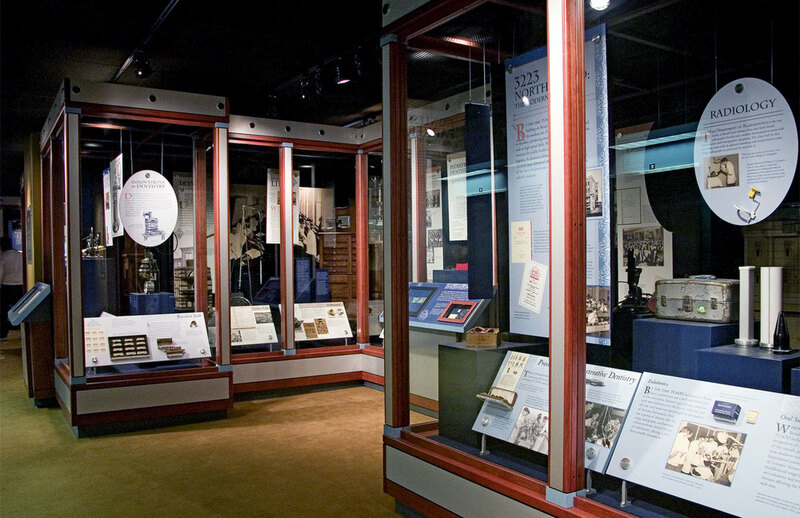 SFD was commissioned by the Temple University School of Dentistry to create a 2,500 square foot permanent exhibition reflective of the school's heritage, high quality, and standards, whose principle audience would be dental students, professionals, and laymen. SFD developed richly detailed casework utilizing polished metals, stained hardwoods, and other materials and finishes evocative of dental instruments. In the cases, significant objects such as instruments created by Paul Revere and the nation's first dental chair, sit side by side with buckets of teeth pulled and collected by Painless Parker. Touchscreen activities allow visitors to test their knowledge of the uses of different instruments or to discern harmful from non-harmful oral microbes. A 19th century dental office is recreated with audio, furnishings, and lifecast figures. Contemporary student volunteer work, performed in Haiti, is shown in a video presentation. "You walked us through the process with patience and humor and delivered an outstanding final product. From our Paul Revere instruments to Painless Parker's bucket of teeth, it is a marvel. Your work was beautifully researched, handsomely presented and authentic in every detail."